In mid-year 2014, indie-published authors began taking home the lion’s share – 40% – of all ebook author earnings generated on Amazon.com. Authors published by all of the Big Five publishers combined slipped into second place at 35%. Some widely-cited industry statistics claim that U.S. ebook sales have plateaued — or are even declining, relative to print. Publishing pundits opine that readers’ Kindles are all “full” now, and talk about the “glut” of ebooks. News articles imply that consumers are abandoning ebooks and are returning to print books, and then those articles speculate about whether ebooks were “just a fad.” Other pundits assert that indie authors will no longer be able to compete with the Big Five traditional publishers, now that those publishers have begun to price some of their ebooks lower. Lots of speculation. Lots of flawed studies based on 2008 methodologies. Lots of inaccurate statistics. And very few facts. As always, Hugh and DG turn to the data for real answers. This is their fifth quarterly Author Earnings report. It is based on a data snapshot of 120,000 of the best selling ebooks on Amazon, giving us a deep cross-sectional data sample comprising roughly 50% of Amazon’s daily ebook sales. According to the publishing industry’s most oft-cited estimate, Amazon controls 67% of the U.S. ebook market. Thus the title-level data used in our analysis includes roughly 33% of all daily ebook sales in the U.S. No other industry survey or ebook market-size estimate comes close to this level of accuracy or detail. Fine, tell me more. How are the Big Five doing? The increasing prevalence of lower-priced Big Five titles has had no measurable effect on the Big Five’s share of titles on Amazon’s daily-sales-based ebook bestseller lists. 81.6% of Simon & Schuster titles in our dataset were tagged with “This price was set by publisher”on their Amazon.com product page. 94.4% of Macmillan titles in our dataset were tagged with “This price was set by publisher” on theirAmazon.com product page. However, Macmillan and Simon & Schuster’s return to agency pricing has not had much effect on the overall ebook market. Indeed, it has had no measurable effect on the Big Five’s share of titles on Amazon’s daily-sales-based ebook bestseller lists. 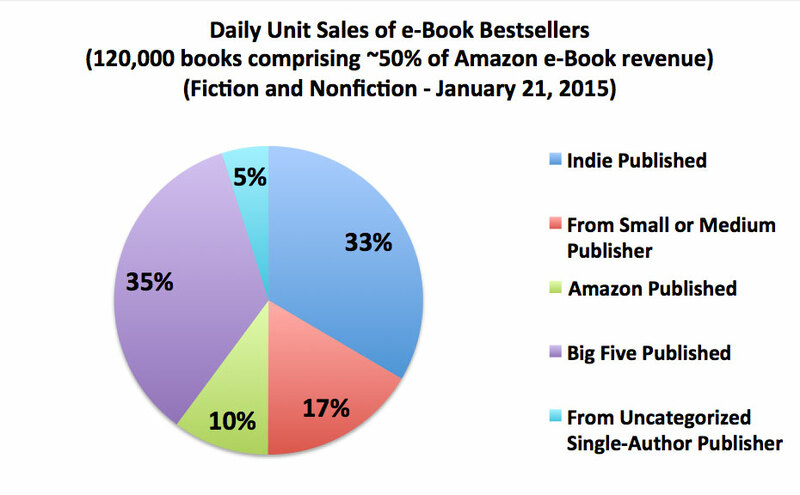 At least a third of all paid ebook unit sales on Amazon.com are Indie self-published ebooks. But the 33% shown is an extremely conservative lower bound on the true indie market share. The real number is almost certainly several percent higher, because the vast majority of the Uncategorized Single-Author Publisher ebooks are also self-published titles — Hugh and DG simply didn’t have the time (or energy) to check all ten thousand of them, one by one. And what they’ve labeled as Small or Medium Publishers — a designation used for all publishers that are not the Big Five and not Amazon Publishing Imprints — includes a significant chunk of multi-author collectives and tiny indie micropresses publishing through KDP. Many in the industry would classify that fraction under self-published ebooks as well. In their past reports on Barnes & Noble’s ebook sales, they found the ratio of ebook sales by publisher type to be roughly the same on Barnes & Noble as on Amazon, and together Amazon and Barnes & Noble command at least 75% of the U.S. ebook market. 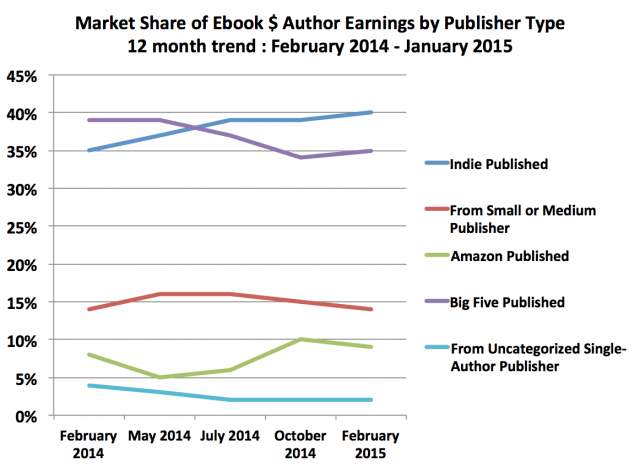 The large indie ebook market share is not an Amazon-only phenomenon. It’s safe to conclude that at least a third of all paid ebook unit sales in the U.S. are Indie self-published ebooks. That’s nice, dear. But Indies don’t earn much, do they? Publishing industry pundits usually prefer to talk about dollar market share instead of unit market share. They point to the higher average price of traditionally-published books and say that publishers bank dollars, not numbers of books sold. So what about gross consumer dollars spent on ebooks? The Big Five publishers as a cohort still command just over half of consumer dollars spent on ebooks. But this post is titled Author Earnings, not Publisher Earnings. The focus is on authors and how much they take home in earnings, rather than how much money is spent on corporate publisher overhead. It is primarily interested in the portion of that gross consumer spend that goes to authors in the form of traditionally-published ebook royalties or self-published ebook revenue share. So, it turns out that 40% of all dollars earned by authors from ebooks on Amazon.com are earned by Indie self-published ebooks. That can’t be right! Things will surely change, right? 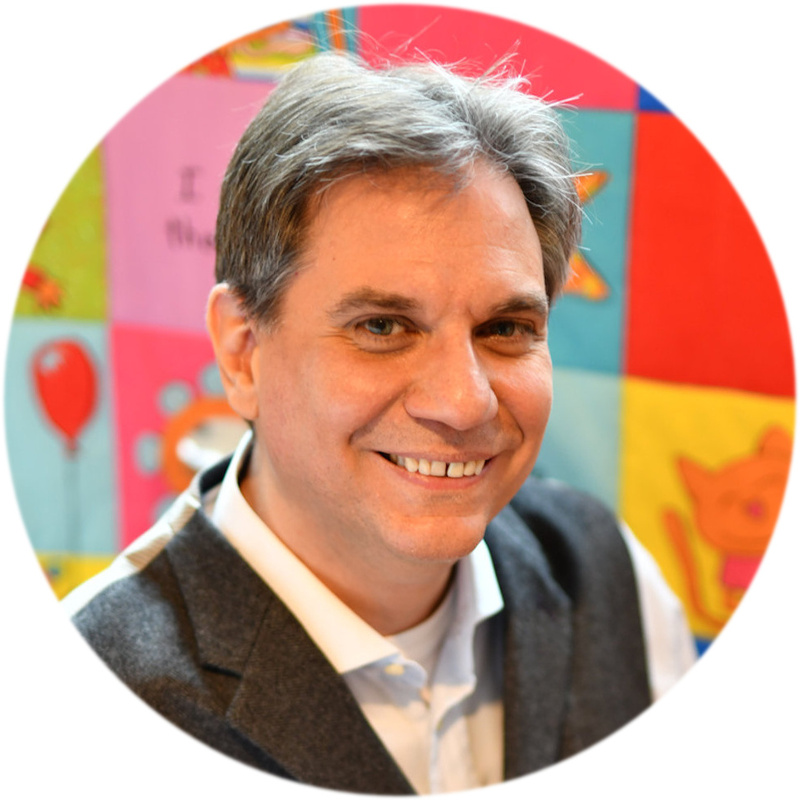 Only seven months ago, the idea that indie self-published authors and their ebooks would outearn all authors published by the Big Five publishers combined was jaw-dropping heresy. Today, it’s boring — a widely-acknowledged fact among knowledgeable authors, if not industry pundits. Many authors who publish both ways point out their earnings disparity in favor of their self-published titles, and so this data is no longer surprising. But what is surprising is how consistent each of the quarterly snapshots has been. And because of that quarter to quarter consistency, we can discern a few broader trends. The most notable change over the last few quarters is the continued progressive growth of indie market share at the expense of traditionally published ebooks. Here, we can see it in unit sales terms, in gross consumer dollar terms, and in the all-important metric of author earnings. Until my return, why don’t you read Runaway Smile for free on my blog? Thanks for sharing these figures. I’m glad they are in pie charts. Makes this so much easier to digest. Interesting piece. We should all take note. Just in case you ever doubt that indie publishing is a feasible career. Thanks for such great information, Nicholas!! Have a super weekend! Just shows how much things are in flux. Interesting stats. Excellent, Nicholas, thanks for digesting and sharing it with us! I’ll Tweet some of the tidbits. This post has certainly opened various opinions. Fascinating information but is it accurate? I believe so. You’re free to check out their original page, as they list their methodology and address that very question rather convincingly, IMHO. I didn’t mean to nit-pick. Thank you. It’s always good to see indies coming on so strong. I know the ‘bigs’ are getting most of the money but I hope they’re paying attention to what readers are reading. Yes, it is interesting how the times they are a-changin’. I’ve had offers from small publishers on two novels and one non-fiction – really bad contracts I rejected. So I sat on them while writing the next one. I’ve watched the markets and waited to see how this all shakes out. This article tears it, I’m going indie, screw the big 5 and the small publishers they ride over. There are still plenty of bad contracts around. The best thing to do is hire a good lawyer who specializes in just this kind of thing, such as the Passive Guy. Or to go Indie, of course – but that carries its own problems – mainly that you have to do a lot of work and marketing that a good publishing house would otherwise share with you. I like anything that shows I have a chance for success if only I am willing to put in the work. Thanks for sharing! Fascinating stuff, Mr. Economist. Thanks for breaking this all down for us. There’s good news and bad news in there for us self-publishers. What do you yourself foresee for the future? I’m already a hybrid author, in that I’m traditionally published (albeit with a twist) in Greece. I see more authors following that route, with some work published traditionally and some Indie. The goal is to make a living out of it, and I’m still quite away from that. Rather interesting numbers, thanks to Nicholas for sharing! 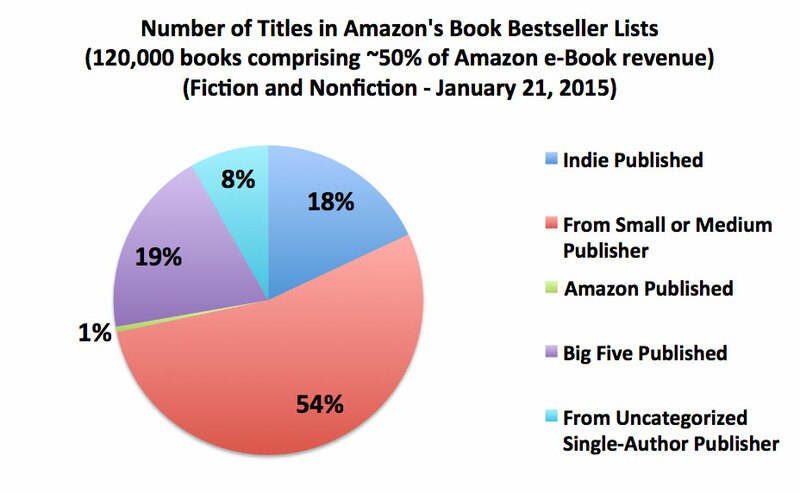 * 33% of all paid ebook unit sales on Amazon.com are indie self-published ebooks. * 20% of all consumer dollars spent on ebooks on Amazon.com are being spent on indie self-published ebooks. 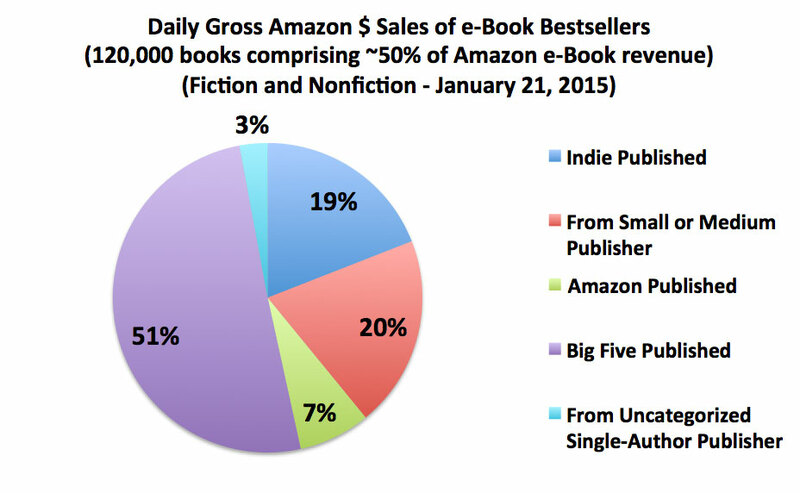 * 40% of all dollars earned by authors from ebooks on Amazon.com are earned by indie self-published ebooks. Interesting. I keep hearing both stories too, so it gets confusing. Many times I wonder if the truth is somewhere in the middle, but the numbers do tell a different story. I’m inclined to believe my own experience above everything else. What’s yours? That long series tend to die down. That’s what I’m seeing now. Also that there’s fewer marketing avenues than last year, but I might not be looking in the right place. eBooks definitely have a stronger foothold than people realize, but I don’t know what to think about the indie scene. I don’t run into too many people that indulge beyond the trad authors. I’m in the position where I have to keep moving forward and see if I can find other ways to promote myself, which takes up more of my attention than the statistics of the business. I’ve never been that person anyway. Also more the artist than the businessman, so the heavy numbers tend to put me into a fugue state. I should probably keep my mouth shut, but… Am I the only one bothered by him lumping small and medium publishers in with Indie? They are two different things all together. Small to medium publishers are not self-publishing. I could name ten or so right off the top of my head, and they aren’t easy to get into. You need to submit and wait and hope you get accepted, deal with rejection, have your manuscript ripped apart– that all spells traditional. 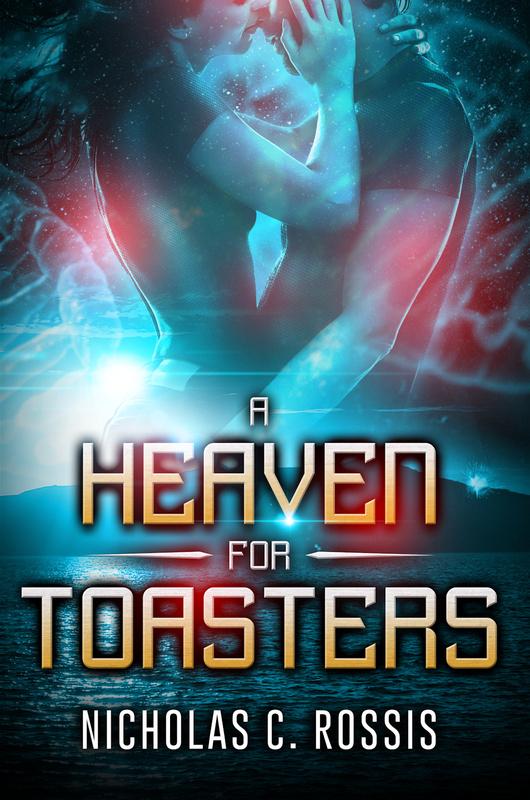 To say it’s self-publishing is crazy! Secondly, the pie charts don’t match his words. And what about all the traditionally published authors who self-publish their back-list titles? Technically that makes them hybrids, but I’m sure they’re lumped in the Indie section. I just think it gives unrealistic expectations for the new writer trying to decide on a publishing path. I’m sorry, NIcholas. Still want me on your blog? I not only want you on my blog, I need you here! 🙂 How else can I hear another point of view? You’re making some interesting points, most of which are addressed in the original post by Hugh. I just don’t want to tire my readers with too much detail, hence the executive summary here. I think you’ll find it an interesting read, though. Lol – your post is scheduled as, well, scheduled. There is definitely a publishing theme developing this morning and here is an excellent summary of how Indie authors are doing in the industry despite what the ‘prophets of doom’ (AKA mainstream pundits) might lead you to believe….. This is an amazing study on indy publishing. With pie charts! Fantastic article. I love love love a pie chart! I hope you don’t mind if I reblog this. I love it when people reblog my posts. Thank you for doing so!